Help support your healthy diet with fiber and B Vitamins.The soluble fiber in vitafusion™ Fiber Well™ Fit aids in digestive health, helps maintain regularity and provides a prebiotic effect in the gut. Fiber Well™ Fit also has 6 essential B Vitamins, which help metabolize fats, carbs and proteins into energy. Fiber is an essential part of a healthy diet, but many of us don't get enough daily fiber. 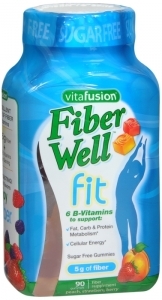 Vitafusion™ Fiber Well Fit makes it easy to get the fiber some people need - all in a delicious, sugar free gummy! As a fiber supplement, adults take two (2) gummies per day. Chew thoroughly before swallowing.